Does this look familiar? 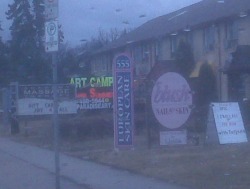 Old static signs cluttered as business owners try and get noticed. Business owners who make the move to "dynamic" LED signage will ensure the success of their businesses. Business owners that want to stand out are flocking to cutting edge and environmentally friendly LED outdoor signs. Don't get left behind and make the move to LED! LED or light emitting diod's are energy efficient micro bulbs - 100% Certified GREEN - that produce vibrant colourful lights and little to no heat. Traditional incandescent light bulbs are the opposite in that they produce dull white or yellow light and a lot of heat. When you change a traditional light bulb you have to wait foor it to cool off. The heat is what makes them so inefficient! LED products have become the common replacement for many types of conventional outdoor lighting applications like Neon, Banner and Incandescent. Up until recently, LED's were too expensive to use for most lighting applications because they're built around advanced semi-conductor material. The price of semi-conductor devices has plummeted over the past decade making LED's a more cost effective option. In the future, LED's will play an even bigger role in the world of technology. Dynamic Messaging - Targeted direct advertising, customers are literally driving by! Increased Sales - Studies have shown that outdoor LED signs can increase sales from 15% to 150%. Cost Effective - 1/2 page ad in major newspapers run around $6K with a 12 hour shelf life - LED's are a steal! Energy Consumption - Up to 80% lees energy consumption than most conventional lighting products. Easy Installation - Can be mounted on most existing sign pylons with an easy plug & play application. Durable - Last up to 100,000 hours! Distinctive - Get the competitive edge and stand out with great curb appeal. Attractive - Display multiple eye catching ads, day or night. Environmental - Ads are created with digital software and uploaded tot he sign digitally, 100% GREEN Certified.